With 2014 just around the corner, one would hardly want to forget that the 20th century was a time of conflict for so much of the world. In The Violent Century, Lavie Tidhar takes a breath and attempts to unravel the purpose of these decades of war, as surely there must be a reason. Mankind could not have sunk so low that his mission would be the destruction of so much life and hope. Throughout it all, there must still be heroes, putting the world back together again. In 1932 a bubble of silence surrounded the world, changing every person who walked the Earth. But whereas some barely noticed the moment and carried on with life regardless, just a few were aware of the change and in that moment everlasting took on a superpower grabbed from nature. Our principal characters Fogg and Oblivion were among those affected. In a scenario purposefully reminiscent of familiar comic books, they are taken into care by the Old Man, removed to a school to learn the use of that power under men such as Alan Turing, and then released into the world as some kind of secret agents missioned with a search for heroes. But while The Violet Century takes us through decades of war, beginning with the battles and proscriptions of the Second World War and continuing outwards and beyond, it becomes clear that war has ripped through much more than ordinary lives. Heroes, too, must fight for survival and freedom and supremacy. All the while, though, Fogg searches for the beginning to it all, to the man who created the bubble, and to the girl who carries sunshine with her wherever she goes. The Violent Century is one of the most extraordinary reads I’ve had this year. It’s unlike anything other novel I’ve read. While it hovers around fantasy and jumps through history, above all else it tells the story of a couple of men, Fogg and Oblivion, who have been given a task they never wanted. They have been thrown out of normal existence and yet still experience feelings towards each other – there is a deeply moving love here – while dealing with sights nobody should have to see. Turning a tale about superheroes upside down, The Violent Century takes an ingenious sideways look at themes that scarred the last century and this. Superheroes are trapped in specimen jars while Jewish twins are experimented on in Auschwitz. Superheroes suffer alongside men and women and children on the Russian front, on the Normandy beaches, or in the firestorms of Vietnam or in the formation of Israel. This is a novel that tells the story of the century by expressing its outrages through emotions run wild, given bodily form, and endowed with rage. I found The Violent Century a very difficult novel to put down even though there were sections that I found hard to read. Despite this, there were moments with a lighter touch and the whole book is peopled by the most wonderful and imaginative creations. Extracts from newspapers, references to comic books and to real people add another dimension and give an air of reality to a world that is unlike any I’ve read about before. But aside from this, the novel is also a mystery story. What is it that Fogg and Oblivion are trying to do? What does the Old Man want? And who was the creator of the transforming bubble? There are lots of questions raised through the story, just as we move through so many environments and places, some more fantastical than others. We are on a hunt. The novel is told through brief chapters that jump between characters and move fluidly between periods. You need to keep your wits about you. Reminiscences occur within reminiscences. Fogg and Oblivion are not necessarily reliable witnesses to history. Events and people move around us, backwards and forwards through the years. Names come and go. It can be difficult to keep track of them and it can lead to moments of confusion and frustration, at least for this reader. Also, this book might be brief but it is most certainly not light. Neither is it forgettable. But despite this being a tale of war and superheroes and the most evil of villains, The Violent Century felt to me primarily like an account of the best and worst of humanity trying to cope with the most difficult of events. What is a hero? Sometimes it can be impossible to tell but even during the very worst of times they can be found. 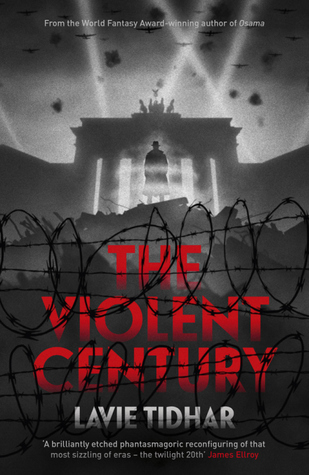 Do take a look at these excellent reviews of The Violent Century by Matt at Reader Dad and Robin at Robin’s Books. This entry was posted in Fantasy, Historical Fiction, Review and tagged 20th century, Fantasy, Historical fiction, World War Two on November 4, 2013 by Kate (For Winter Nights).